Just like me and my mother… In some ways we are alike but in many ways I am a complete opposite of my Amma. She is the young grandmother who likes to climb the tree to pluck the freshest Jamoon fruits for her two darling grandkids while I look down from second floor terrace of my parent’s house and feel giddy with scare! Born tomboy to eight siblings, she is a fiery one who grew up wresting with her four brothers and other boys at school and yet was gentle soul to her four sisters and her mother. 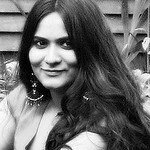 I, on the other hand, was always a quiet sort who liked to sit in a quiet corner flipping through pages after pages of variety of books which never failed me to take on a wonderful ride to wonderlands… She is the extrovert, full of life, and so much to give to anyone who came to her with open arms and her signature dimpled smile. I am the introvert, who would rather stay away from the crowd, and be with my loved ones sharing whatever little I have to offer. She is the one who can strike conversation with a complete stranger and make them share their life’s top secret with her, where as I shy away from people and crowd. For her the life is full of surprises, rather wonderful ones, and for me life is full of puzzles, sometimes a complicated one! For her life is generous and giving, and for me life is two faced with equal measure of giving and taking! She is a dreamer and I am the practical one, so much so that sometimes I step into her shoes and become her mother to show her that not every one around us is as good as she thinks and there are some grey shades in our rather colourful and sometimes black and white life! For the last couple of weeks I have begun to notice the changes in me where I am slowly becoming the mirror image of my mother… No, not entirely but in rather small actions and things I do on daily basis. The typical impatient, hot tempered with mood swings that put shame to unpredictable weather in this country is changing… I am changing… I am much calmer and patient than I was few years ago… I am more forgiving than I ever was… I find goodness in every single person I walk past or those who come in to my life by accident or by intent… I am more trusting than I could last remember… I may still not be a social butterfly but I no longer hide in one corner when the party is in full swing… I may still not find it comfortable to be put under the spot light but I am not blinking at the bright light focused on me like some lost kid in a big bad city… And most importantly I love other people in my life more than I love myself! Yes, the selfish and the all important ‘me’ is ready to accept at last that I put my loved ones happiness above my own happiness!!! And Amma, I have to thank you for all the above as I now know the joy of giving is much greater than the happiness I felt when taking… It is great to see the world the way you see and live the way you do! I know it’s just the beginning, but I the journey so far has been rather an eye opener and joyful! All said and done, I am far from becoming like her when it comes to cooking… She can cook under pressure, with no planning and also with just a handful of ingredients! I, on the other hand, need lot of time to think and decide on what to cook, and I kind of start to flutter my wings when one of the ingredients goes missing! She has the magical power to turn one of the most common dish into one of the most exotic and exciting thing, where as I can ruin the most exotic and expensive ingredient within a blink of an eye! Her cooking technique is quick and simple and I am known to make even the simplest recipe unnecessarily complicated! :) There are times when I end up adding too many ingredients in to a pot and stir it merrily until the end product is far away from my original planned dish! Oh yes, I still need to learn the art of using just a handful of ingredients which is all needed to make an honest, delicious bowl of goodness! But there are times where I surprise myself! And the day when I made this simple yet delicious Stuffed Baby Eggplants/Brinjal/Aubergine cooked in mildly spiced coconut and peanut gravy. Just a handful of ingredients and yet the end result is lip-smacking good! The spice powder used for stuffing the baby eggplant serves another purpose as the base of delicious creamy gravy and hence cutting the time by half for chopping the vegetable, roasting the spices, grinding them to paste and cooking them get some creamy gravy as in other recipes for stuffed vegetables. The spices used are minimal to get the best out of these beauties, a white eggplants (now you know why they are called eggplants! ), but you can always add more spices of your choice to your liking! The photos don't do much justice to the final outcome as I took them at night using artificial under cabinet and kitchen lights, but I didn't want this post to die slowly in ever growing recipe drafts as it tasted oh-so-good! This recipe in spite of bad food photographs deserved a post of it's own... 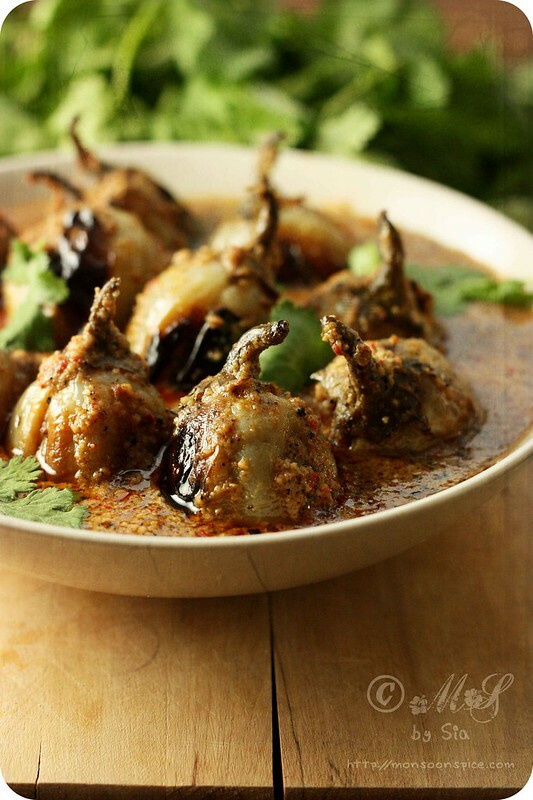 Serve these delicious Stuffed Baby Eggplants/Brinjal/Aubergine with any Indian flat breads (Akki Rotti is my favourite to pair this Stuffed Baby Eggplants/Brinjal/Aubergine) or with flavoured or plain Basmati rice and see them disappearing in no time! Slit the baby aubergine in the centre to ¾ th keeping the stems intact. Make another slit making + mark. Place these baby eggplants in a bowl filled with cold water and a tsp of salt. Dry roast coriander seeds, cumin seeds, fennel seeds and dry red chillies for 2 minutes on medium flame until the whole kitchen smells like a piece of heaven! Transfer the roasted spices to a bowl. In a same pan, dry roast desiccated coconut till it turns light golden in colour, about 1 minute. Transfer it to the bowl with roasted spices. 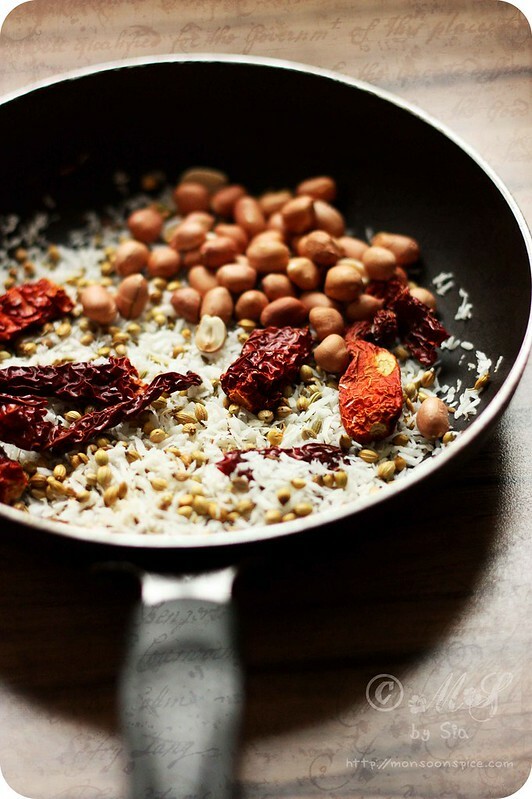 Let the roasted spices and desiccated coconut cool completely before grinding them all with a roasted peanuts to fine powder. 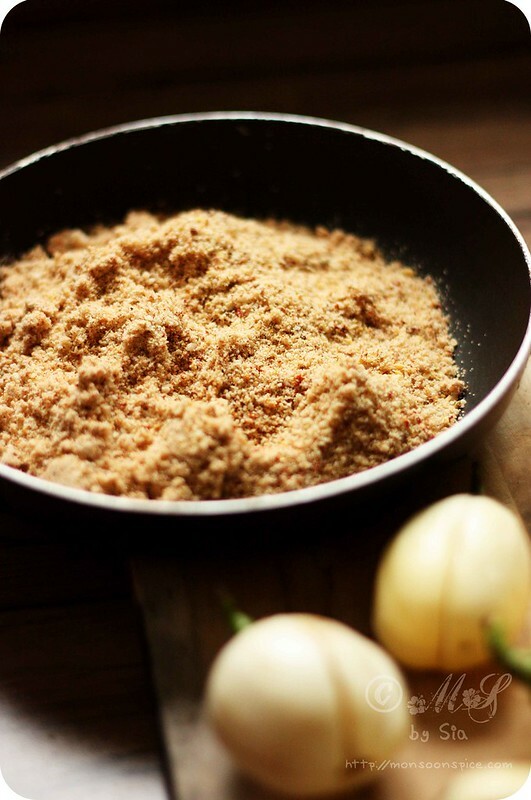 Add sugar, salt to taste and dry mango powder to ground powder and mix them well. 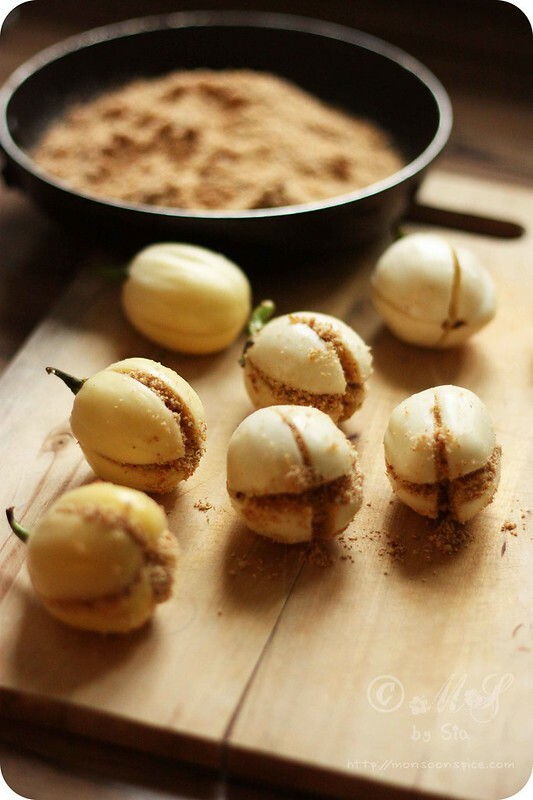 Now start stuffing the baby eggplants with about ½ to ¾ tbsp of spice powder depending on the size of baby eggplant. Take care not to break the eggplant from its stem. Once you have stuffed all of the baby eggplants, you will still be left with the ground spice powder. Keep it aside until needed. Heat oil in a thick bottomed pan on high flame till it reaches smoking point and then lower the flame to medium. Arrange the stuffed baby eggplants in one single layer and cover the pan with lid. Let it cook undisturbed for 3-4 minutes. Remove the lid and gently flip the baby eggplants on other side. Cover the lid again and let it cook for another 3 minutes. This will help in bringing the smoky flavour to the baby eggplants by charring their skin to dark brown colour. Now mix in the remaining ground powder and add about 1 to 1½ cups of water. Mix them well and cover the lid. Let it cook for 7-10 minutes or until the baby eggplants are cooked well, stirring in between to make sure that the gravy doesn’t stick to the bottom of the pan. Add little more water if you find the gravy to be too thick. That’s it!!! The delicious bowl of Quick Stuffed Baby Eggplants/Brinjal is ready to be served with any Indian flat breads (Whole Wheat Naan or Butter Naan or Akki Rotti with any stuffed parathas) or plain/flavoured Basmati rice. The cooking time varies based on the size of baby eggplants used. So increase or decrease the cooking time based on how small or big the baby eggplant you use. 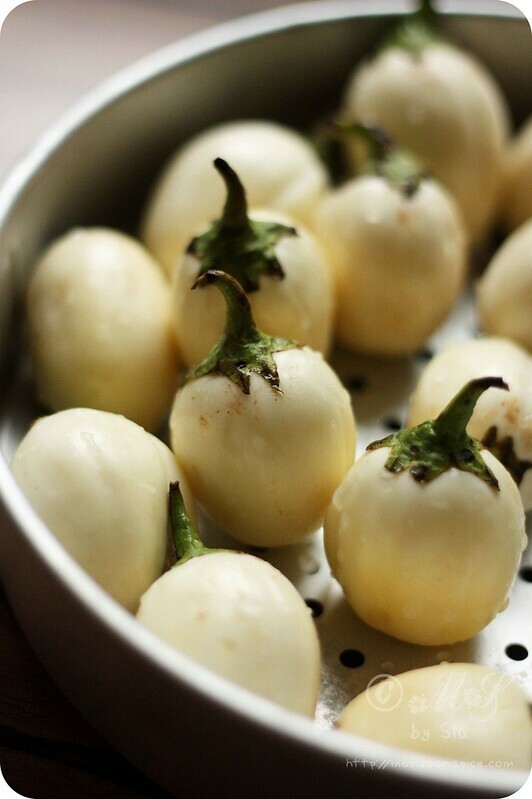 I have used the white coloured baby eggplants which can be replaced with the normal purple variety that is commonly available in any Asian stores. 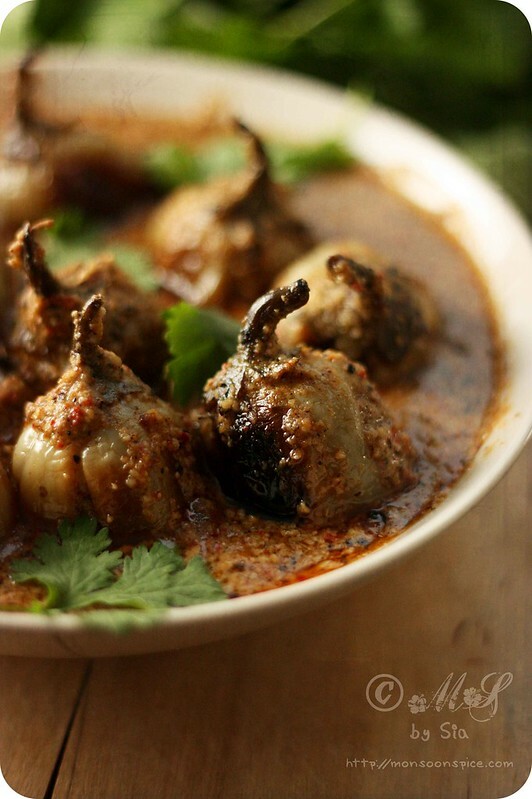 The peanut and coconut thickens the gravy as well as gives creamy base to this Stuffed Baby Eggplants. The aubergine looks good and delicious in the pictures too Sia... 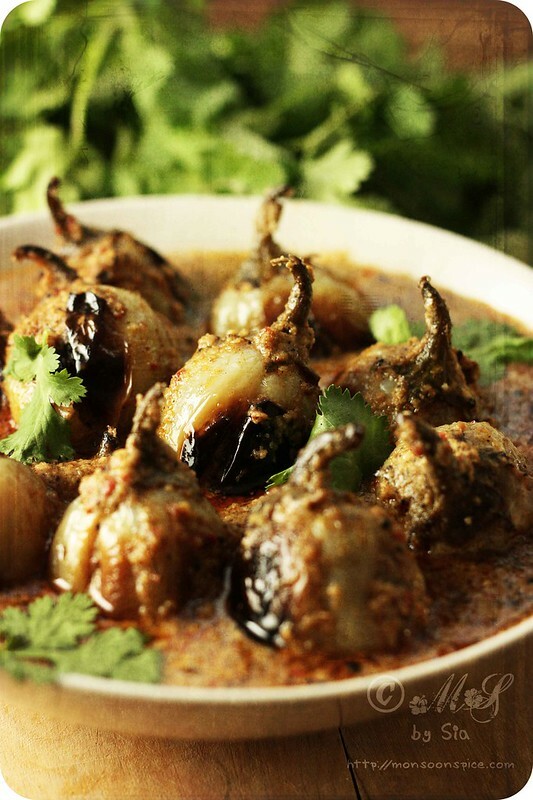 Stuffed brinjal is a classic recipe... always love it!!! this is my kind of stuffed brinjals. much similar to the way my mom makes. the pics are good, sia. A beautiful dish! I'd love to taste that speciality as it looks ever so scrumptious. Lovely photos. What a lovely post sia!! I thoroughly enjoyed reading the post as well as the recipe. I have tried making stuffed curry from the white egg plants that we get here. But they turned out to be bitter. Will try making this from the purple eggplants. I actually love these photos! Those little eggplants are so beautiful. Interesting combination of spices for the masala powder Sia. 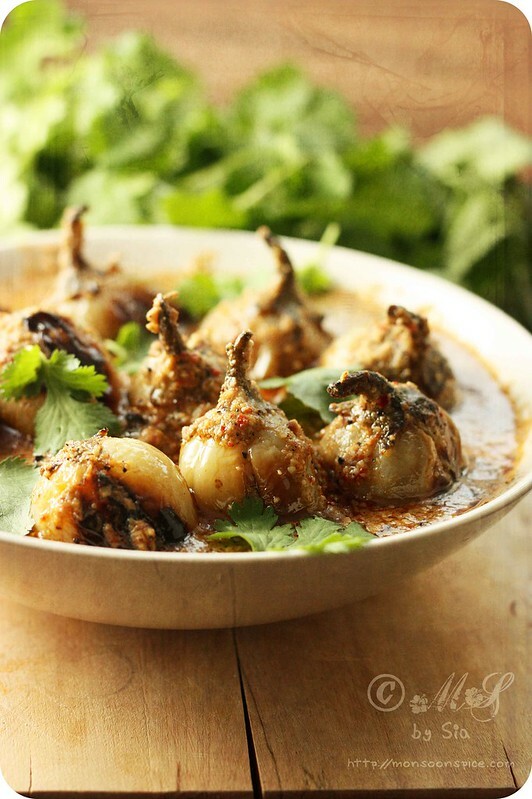 I make eggplant very often so I will try this recipe for sure! Delicious looking stuffed eggplant...Very beautiful clicks..
Aaaw! Ur mom sounds great! And u are one super Mommy too, sweetie! I will keep this recipe in mind for the hubby, he likes eggplants! I can not get dried mango powder here in Japan. Is it tart tasting? Can I use lemon juice?? I really want to try this dish. I made your Saag dish. It was wonderful. @Cynthia Pinto, bhagare baingan is much different than this one or I can say this is the short-cut method :) you can find the recipe for bhagare baingan here. 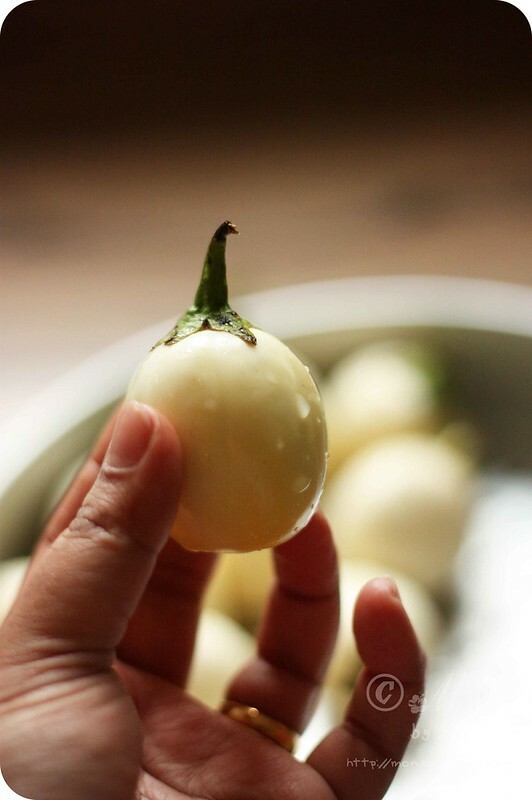 lovely post and perfectly done baby eggplants in a very flavourful and spicy gravy.beautiful clicks..
Incredibly beautiful post...those eggplants are soo cute:). Great recipe & awesome pictures!!!! only you could make those eggplants look so pretty Sia:) gorgeous clicks, love all that gravy and the delicious recipe! Sia what a lovely post....im drooling at the sight of your eggplants! This looks like a Five star recipe.. I am in love with the clicks.. Superb!!! I made this recipe last weekend for a gathering. It turned out perfect. Every one at the gathering really liked it. I had used purple small eggplants. Thanks for a great recipe. @spandana, that's really really wonderful :) thank you! ohh dear...the recipe looks so so tempting !!! !loved all your clicks !!! !the stuffing specially !!!!! Made this and seriously it was a taste sensation, like noting I'd ever cooked before. I'm making it again for my vegi friends. I reckon they'll be very impressed! !